James Fuller, professor of history at the University of Indianapolis, offers a bold reinterpretation of Indiana’s Civil War governor, Oliver P. Morton, in a new book. 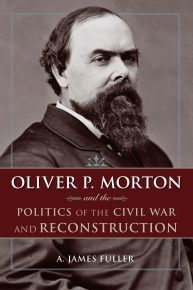 “Oliver P. Morton and the Politics of the Civil War and Reconstruction,” the first full biography of Morton to be published in over a century, provides new insight into Indiana’s most important political leader of the 19th century. 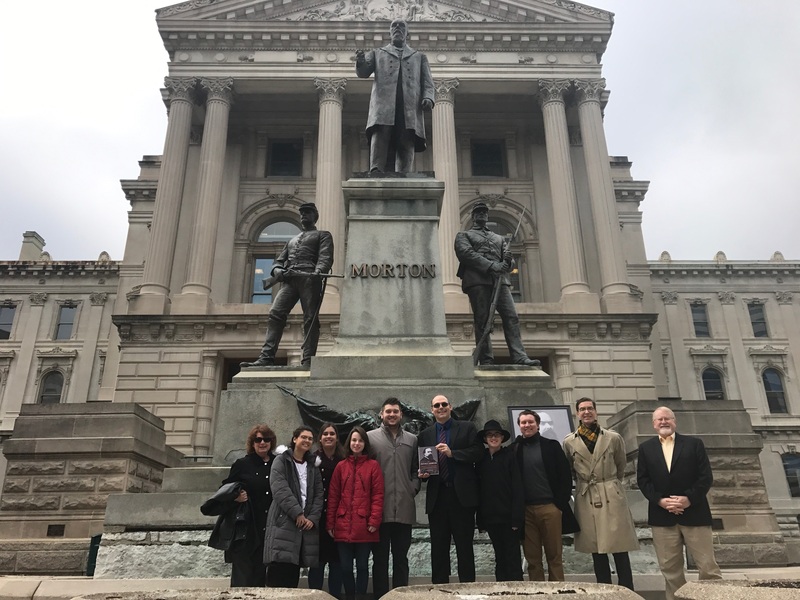 About a dozen people gathered at the Morton Monument on the east steps of the Indiana Statehouse in mid-November to launch the book. Stephen E. Towne of IUPUI introduced Fuller, who spoke briefly, then read a section from the book. Fuller then presented a copy of the biography to the office of current Indiana governor, Eric Holcomb. Daniel Miller, a University of Indianapolis student who worked on Governor’s campaign in 2016, accepted the book on behalf of the governor. “At a time when the Civil War is once again a political issue amid calls to remove Confederate monuments across the country, this book serves as a reminder of Indiana’s role in that pivotal era in the nation’s history and explains why Oliver P. Morton still stands as a fitting symbol of the part that the Hoosier state played in saving the nation from rebellion,” Fuller said. Most readers know Morton as the state’s Civil War governor and for his efforts to recruit and supply the soldiers and help the Union win the war. “But not all of them are familiar with the high drama that his leadership involved,” Fuller said. Fuller explained that Morton virtually ran the state as a dictator for 22 months in the middle of the war after the Democrats tried to thwart the Union war effort in Indiana. Morton was the target of assassins and helped the military investigate traitors on the home front. Following the Civil War, Morton became the U.S. senator from Indiana and a national leader of the Radical Republicans during Reconstruction. Fuller notes Morton came close to winning the Republican nomination for the presidency in 1876, then helped settle that disputed election in favor of his friend Rutherford B. Hayes. Readers will find parallels and connections to modern politics in Fuller’s book, ranging from issues including the use of government power, economic policy, terrorism, the surveillance state and the violation of civil liberties. Morton also called for abolishing or reforming the Electoral College. “He was a political leader in a time of extreme polarization, when Americans were deeply divided and feared that the other side in politics was out to destroy the country. This led to fierce partisanship and dirty politics,” Fuller said.